9.3.3 Small molecules targeted therapy drugs; Tyrosine kinase inhibitors; imatinib (Gleevec/Glivec) and gefitinib (Iressa). The immune reaction, or GVHD, is treated by administering drugs to the patient after the transplant that reduce the ability of the donated immune cells to attack and injure the patient’s tissues. See Graft Versus Host Disease. Allogeneic stem cell transplants for patients who are older or have overall poor health are relatively uncommon. This is because the pre-transplant conditioning therapy is generally not well tolerated by such patients, especially those with poorly functioning internal organs. However, reduced intensity allogeneic stem cell transplants may be an appropriate treatment for some older or sicker patients. One goal of allogeneic stem cell transplant is to cause the T lymphocytes in the donor’s blood or marrow to take hold (engraft) and grow in the patient’s marrow. Sometimes the T lymphocytes attack the cancer cells. When this happens, it’s called graft versus tumor (GVT) effect (also called graft versus cancer effect). The attack makes it less likely that the disease will return. This effect is more common in myeloid leukemias than it is in other blood cancers. Unfortunately, T lymphocytes are the same cells that cause graft versus host disease (GVHD). Because of this serious and sometimes life-threatening side effect, doctors in certain cases want to decrease the number of T lymphocytes to be infused with the stem cells. This procedure, called T-lymphocyte depletion, is currently being studied by researchers. The technique involves treating the stem cells collected for transplant with agents that reduce the number of T lymphocytes. The aim of T-lymphocyte depletion is to lessen GVHD’s incidence and severity. However, it can also cause increased rates of graft rejection, a decreased GVT effect and a slower immune recovery. Doctors must be careful about the number of T lymphocytes removed when using this technique. Until recently, scientists primarily worked with two kinds of stem cells from animals and humans: embryonic stem cells and non-embryonic “somatic” or “adult” stem cells. The functions and characteristics of these cells will be explained in this document. Scientists discovered ways to derive embryonic stem cells from early mouse embryos more than 30 years ago, in 1981. The detailed study of the biology of mouse stem cells led to the discovery, in 1998, of a method to derive stem cells from human embryos and grow the cells in the laboratory. These cells are called human embryonic stem cells. The embryos used in these studies were created for reproductive purposes through in vitro fertilization procedures. When they were no longer needed for that purpose, they were donated for research with the informed consent of the donor. In 2006, researchers made another breakthrough by identifying conditions that would allow some specialized adult cells to be “reprogrammed” genetically to assume a stem cell-like state. This new type of stem cell is called induced pluripotent stem cells (iPSCs). Stem cells differ from other kinds of cells in the body. All stem cells—regardless of their source—have three general properties: they are capable of dividing and renewing themselves for long periods; they are unspecialized; and they can give rise to specialized cell types. Stem cells are capable of dividing and renewing themselves for long periods. Unlike muscle cells, blood cells, or nerve cells—which do not normally replicate themselves—stem cells may replicate many times, or proliferate. A starting population of stem cells that proliferates for many months in the laboratory can yield millions of cells. If the resulting cells continue to be unspecialized, like the parent stem cells, the cells are said to be capable of long-term self-renewal. What are the factors in living organisms that normally regulate stem cell proliferation and self-renewal? Discovering the answers to these questions may make it possible to understand how cell proliferation is regulated during normal embryonic development or during the abnormal cell division that leads to cancer. Stem cells are unspecialized. One of the fundamental properties of a stem cell is that it does not have any tissue-specific structures that allow it to perform specialized functions. For example, a stem cell cannot work with its neighbors to pump blood through the body (like a heart muscle cell), and it cannot carry oxygen molecules through the bloodstream (like a red blood cell). However, unspecialized stem cells can give rise to specialized cells, including heart muscle cells, blood cells, or nerve cells. Stem cells can give rise to specialized cells. When unspecialized stem cells give rise to specialized cells, the process is called differentiation. 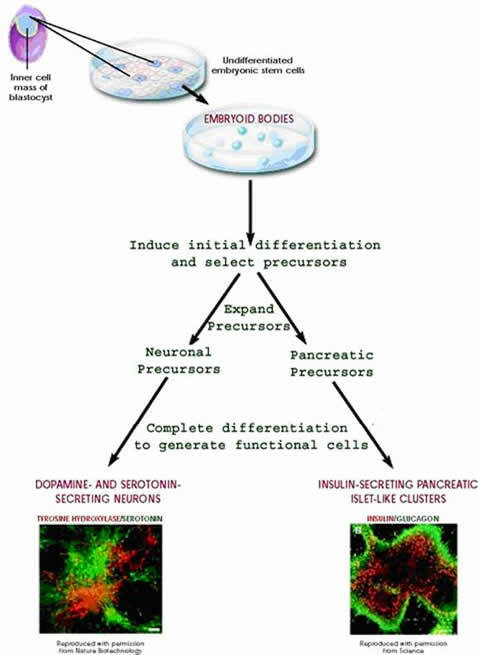 While differentiating, the cell usually goes through several stages, becoming more specialized at each step. Scientists are just beginning to understand the signals inside and outside cells that trigger each step of the differentiation process. The internal signals are controlled by a cell’s genes, which are interspersed across long strands of DNA and carry coded instructions for all cellular structures and functions. The external signals for cell differentiation include chemicals secreted by other cells, physical contact with neighboring cells, and certain molecules in the microenvironment. The interaction of signals during differentiation causes the cell’s DNA to acquire epigenetic marks that restrict DNA expression in the cell and can be passed on through cell division. Adult stem cells typically generate the cell types of the tissue in which they reside. For example, a blood-forming adult stem cell in the bone marrow normally gives rise to the many types of blood cells. It is generally accepted that a blood-forming cell in the bone marrow—which is called a hematopoietic stem cell—cannot give rise to the cells of a very different tissue, such as nerve cells in the brain. In a typical stem cell transplant for cancer very high doses of chemo are used, often along with radiation therapy, to try to destroy all the cancer cells. This treatment also kills the stem cells in the bone marrow. Soon after treatment, stem cells are given to replace those that were destroyed. These stem cells are given into a vein, much like a blood transfusion. Over time they settle in the bone marrow and begin to grow and make healthy blood cells. This process is called engraftment. There are 3 basic types of transplants. They are named based on who gives the stem cells. These stem cells come from you alone. In this type of transplant, your stem cells are taken before you get cancer treatment that destroys them. Your stem cells are removed, or harvested, from either your bone marrow or your blood and then frozen. To find out more about that process, please see the section “What’s it like to donate stem cells?” After you get high doses of chemo and/or radiation the stem cells are thawed and given back to you. One advantage of autologous stem cell transplant is that you are getting your own cells back. When you donate your own stem cells you don’t have to worry about the graft attacking your body (graft-versus-host disease) or about getting a new infection from another person. But there can still be graft failure, and autologous transplants can’t produce the “graft-versus-cancer” effect. This kind of transplant is mainly used to treat certain leukemias, lymphomas, and multiple myeloma. It’s sometimes used for other cancers, like testicular cancer and neuroblastoma, and certain cancers in children. A possible disadvantage of an autologous transplant is that cancer cells may be picked up along with the stem cells and then put back into your body later. Another disadvantage is that your immune system is still the same as before when your stem cells engraft. The cancer cells were able to grow despite your immune cells before, and may be able to do so again. The need to remove cancer cells from transplants or transplant patients and the best way to do it is being researched. Doing 2 autologous transplants in a row is known as a tandem transplant or a double autologous transplant. In this type of transplant, the patient gets 2 courses of high-dose chemo, each followed by a transplant of their own stem cells. All of the stem cells needed are collected before the first high-dose chemo treatment, and half of them are used for each transplant. Most often both courses of chemo are given within 6 months, with the second one given after the patient recovers from the first one. In the most common type of allogeneic transplant, the stem cells come from a donor whose tissue type closely matches the patient’s. (This is discussed later under “HLA matching” in the section called “ Donor matching for allogeneic transplant.”) The best donor is a close family member, usually a brother or sister. If you do not have a good match in your family, a donor might be found in the general public through a national registry. This is sometimes called a MUD (matched unrelated donor) transplant. Transplants with a MUD are usually riskier than those with a relative who is a good match. Blood taken from the placenta and umbilical cord of newborns is a newer source of stem cells for allogeneic transplant. Called cord blood, this small volume of blood has a high number of stem cells that tend to multiply quickly. But the number of stem cells in a unit of cord blood is often too low for large adults, so this source of stem cells is limited to small adults and children. Doctors are now looking at different ways to use cord blood for transplant in larger adults, such as using cord blood from 2 donors. Pros of allogeneic stem cell transplant: The donor stem cells make their own immune cells, which could help destroy any cancer cells that remain after high-dose treatment. This is called the graft-versus-cancer effect. Other advantages are that the donor can often be asked to donate more stem cells or even white blood cells if needed, and stem cells from healthy donors are free of cancer cells. Cons to allogeneic stem cell transplants: The transplant, also known as the graft, might not take — that is, the donor cells could die or be destroyed by the patient’s body before settling in the bone marrow. Another risk is that the immune cells from the donor may not just attack the cancer cells – they could attack healthy cells in the patient’s body. This is called graft-versus-host disease (described in the section called “Problems that may come up shortly after transplant”). There is also a very small risk of certain infections from the donor cells, even though donors are tested before they donate. A higher risk comes from infections you have had, and which your immune system has under control. These infections often surface after allogeneic transplant because your immune system is held in check (suppressed) by medicines called immunosuppressive drugs. These infections can cause serious problems and even death. Allogeneic transplant is most often used to treat certain types of leukemia, lymphomas, multiple myeloma,myelodysplastic syndrome, and other bone marrow disorders such as aplastic anemia. For some people, age or certain health conditions make it more risky to wipe out all of their bone marrow before a transplant. For those people, doctors can use a type of allogeneic transplant that’s sometimes called a mini-transplant. Compared with a standard allogeneic transplant, this one uses less chemo and/or radiation to get the patient ready for the transplant. Your doctor might refer to it as a non-myeloablative transplant or mention reduced-intensity conditioning (RIC). The idea here is to kill some of the cancer cells along with some of the bone marrow, and suppress the immune system just enough to allow donor stem cells to settle in the bone marrow. Unlike the standard allogeneic transplant, cells from both the donor and the patient exist together in the patient’s body for some time after a mini-transplant. But slowly, over the course of months, the donor cells take over the bone marrow and replace the patient’s own bone marrow cells. These new cells can then develop an immune response to the cancer and help kill off the patient’s cancer cells — the graft-versus-cancer effect. This is a special kind of allogeneic transplant that can only be used when the recipient has an identical sibling (twin or triplet) who can donate — someone who will have the same tissue type. An advantage of syngeneic stem cell transplant is that graft-versus-host disease will not be a problem. There are no cancer cells in the transplant, either, as there would be in an autologous transplant. A disadvantage is that because the new immune system is so much like the recipient’s immune system, there is no graft-versus-cancer effect, either. Every effort must be made to destroy all the cancer cells before the transplant is done to help keep the cancer from relapsing (coming back). Graft-versus-host disease(GVHD) occurs because of differences between the cells of your body and the donated cells and is a common side effect of an allogeneic bone marrow transplant. An allogeneic transplant uses blood cells from a family member, unrelated donor or cord blood unit. GVHD can affect many different parts of the body including the skin, eyes, mouth, stomach, and intestines. Acute GVHD: Develops in the first 100 days or so after transplant but can occur later. This primarily affects the skin, stomach, intestines, and liver. Chronic GVHD: Usually develops 3-6 months after transplant, but signs can appear earlier or later. If you have had or currently have acute GVHD, you are more likely to have chronic GVHD. The severity of acute and chronic GVHD can range from mild to life-threatening. Doctors often see mild GVHD as a good thing after an allogeneic transplant when the transplant was done for a blood cancer. It is a sign that the donor’s immune system is working to destroy any remaining cancer cells. Patients who experience some GVHD have a lower risk of the cancer returning after transplant than patients who do not develop GVHD. If the transplant was to treat a disease other than cancer disease, like aplastic anemia, then the doctor may want to treat even mild GVHD. Lancet. 2009 May 2; 373(9674): 1550–1561. The number of allogeneic hematopoietic cell transplantations (HCT) continues to increase with more than 25,000 allogeneic transplantations performed annually. The graft-versus-leukemia / tumor (GVL) effect during allogeneic HCT effectively eradicates many hematological malignancies.1 The development of novel strategies that use donor leukocyte infusions, non-myeloablative conditioning and umbilical cord blood (UCB) transplantation have helped expand the indications for allogeneic HCT over the last several years, especially among older patients.2 Improvements in infectious prophylaxis, immunosuppressive medications, supportive care and DNA-based tissue typing have also contributed to improved outcomes after allogeneic HCT.1 Yet the major complication of allogeneic HCT, graft-versus-host disease (GVHD), remains lethal and limits the use of this important therapy.2 Given current trends, the number of transplants from unrelated donors is expected to double within the next five years, significantly increasing the population of patients with GVHD. In this seminar we review advances made in identifying the genetic risk factors and pathophysiology of this major HCT complication, as well as its prevention, diagnosis and treatment. Fifty years ago Billingham formulated three requirements for the development of GVHD: the graft must contain immunologically competent cells; the recipient must express tissue antigens that are not present in the transplant donor; and the recipient must be incapable of mounting an effective response to eliminate the transplanted cells.3 We know now that the immunologically competent cells are T cells, and that GVHD can develop in various clinical settings when tissues containing T cells (blood products, bone marrow, and solid organs) are transferred from one person to another who is not able to eliminate those cells.4, 5 Patients, whose immune systems are suppressed, and who receive white blood cells from another individual, are at particularly high risk for GVHD. Polymorphisms in both donors and recipients for cytokines that are involved in the classical `cytokine storm’ of GVHD (discussed below) have been implicated as risk factors for GVHD.15 Tumor Necrosis Factor (TNF)-α, Interleukin 10 (IL-10), Interferon-γ (IFNγ) variants have correlated with GVHD in some, but not all, studies.16–18 Genetic polymorphisms of proteins involved in innate immunity, such as nucleotide oligomerization domain 2 and Keratin 18 receptors, have also been associated with GVHD.19–22 Future strategies to identify the best possible transplant donor will probably incorporate both HLA and non-HLA genetic factors. Two important principles are important to consider regarding the pathophysiology of acute GVHD. First, acute GVHD reflects exaggerated but normal inflammatory mechanisms mediated by donor lymphocytes infused into the recipient where they function appropriately, given the foreign environment they encounter. Second, the recipient tissues that stimulate donor lymphocytes have usually been damaged by underlying disease, prior infections, and the transplant conditioning regimen.29 As a result, these tissues produce molecules (sometimes referred to as “danger” signals) that promote the activation and proliferation of donor immune cells.42–45 Mouse models havebeen central to our identification and understanding of the pathophysiologic mechanisms of GVHD, and canine models have been critical to the development of clinically useful strategies for GVHD prophylaxis and treatment and to the development of donor leukocyte infusions.36, 46, 47 Based largely on these experimental models, the development of acute GVHD can be conceptualized in three sequential steps or phases: (1) activation of the APCs; (2) donor T cell activation, proliferation, differentiation and migration; and (3) target tissue destruction (Figure 3). In mouse models, where genetic differences between donor and recipient strains can be tightly controlled, CD4+ cells induce acute GVHD to MHC class II differences, and CD8+ cells induce acute GVHD to MHC class I differences.59–61 In the majority of HLA-identical HCTs, both CD4+ and CD8+ subsets respond to minor histocompatibility antigens and can cause GVHD in HLA-identical HCT. Regulatory T cells can suppress the proliferation of conventional T cells and prevent GVHD in animal models when added to donor grafts containing conventional T cells.62 In mice, the Foxp3 protein functions as a master switch in the development of regulatory T cells, which normally constitute 5% of the CD4+ T cell population.62 Regulatory T cells secrete anti-inflammatory cytokines IL-10 and Transforming Growth Factor(TGF)-β and can also act through contact-dependent inhibition of APCs.62 It is likely that the use of regulatory T cells in clinical acute GVHD will require improved techniques to identify and expand them. Activation of immune cells results in rapid intracellular biochemical cascades that induce transcription of genes for many proteins including cytokines and their receptors. Th1 cytokines (IFN-γ, IL-2 and TNF-α) are produced in large amounts during acute GVHD. IL-2 production by donor T cells remains the principal target of many current clinical therapeutic and prophylactic approaches to GVHD, such as cyclosporine, tacrolimus and monoclonal antibodies (mAbs) directed against IL-2 and its receptor.9 But emerging data indicate an important role for IL-2 in the generation and maintenance of CD4+ CD25+ T regs, suggesting that prolonged interference with IL-2 may have an unintended consequence of preventing the development of long term tolerance after allogeneic HCT.67 IFN-γ has multiple functions and can either amplify or reduce GVHD.68,69 IFN-γ may amplify GVHD by increasing the expression of molecules such as chemokines receptors, MHC proteins, and adhesion molecules; it also increases the sensitivity of monocytes and macrophages to stimuli such as LPS and accelerates intracellular cascades in response to these stimuli.70Early polarization of donor T cells so that they secrete less IFN-γ and more IL-4 can also attenuate experimental acute GVHD.71 IFN-γ may amplify GVHD by directly damaging epithelium in the GI tract and skin and inducing immnosuppression through the induction of nitric oxide.72 By contrast, IFN-γ may suppress GVHD by hastening the apoptosis of activated donor T cells.69, 73. This complexity means the manipulation of IFN-γ may have diverse effects in vivo, making it a challenging target with respect to therapeutic intervention. IL-10 plays a key role in suppression of immune responses, and clinical data suggest it may regulate acute GVHD.17 TGF-β, another suppressive cytokine can suppress acute GVHD but exacerbate chronic GVHD.74 Thus the timing and duration of the secretion of any given cytokine may determine the specific effects of that cytokine on GVHD severity. 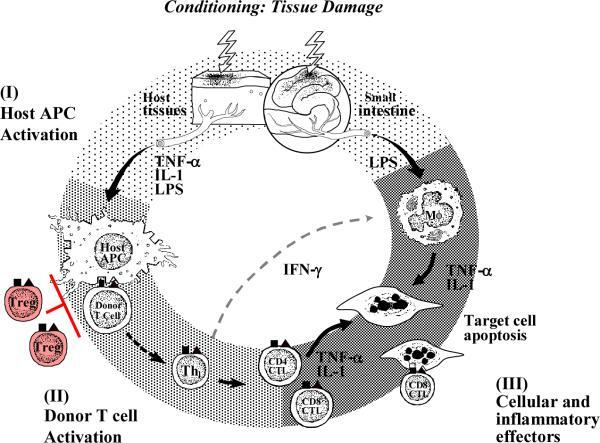 The effector phase of this process is a complex cascade of both cellular mediators such as cytotoxic T lymphocytes(CTLs) and NK cells and soluble inflammatory mediators such as TNF-α, IFN-γ, IL-1 and nitric oxide.2, 29 These soluble and cellular mediators synergize to amplify local tissue injury and further promote inflammation and target tissue destruction. Based on the evidence from animal models regarding the central role of T cells in initiating GVHD, numerous clinical studies evaluating T cell depletion (TCD) as prophylaxis for GVHD were performed in the 1980’s and 1990’s. There were three principal TCD strategies: (1) negative selection of T cells ex vivo, (2) positive selection of CD34+ stem cells ex vivo; and (3) anti-T cell antibodies in vivo.83Most strategies showed a significant limitation in both acute and chronic GVHD.84–88 Unfortunately, the lower incidence of severe GVHD was offset by high rates of graft failure, relapse of malignancy, infections, and Epstein-Barr virus-associated lymphoproliferative disorders. Negative selection purging strategies using various anti-T cell antibodies achieved similar long-term results regardless of the breadth of antibody specificity.89–93 One large registry study demonstrated that purging strategies using antibodies with broad specificities produced inferior leukemia-free survival than standard immunosuppression in patients receiving unrelated donor transplants.94 Several studies have investigated partial T cell depletion, either by eliminating specific T cell subsets (e.g., CD8+) or by titrating the dose of T cells present in the inoculum.95–97 None of these approaches, however, has convincingly demonstrated an optimal strategy that improves long-term survival. An alternative strategy to TCD attempted to induce anergy in donor T cells by ex vivo antibody blockade of co-stimulatory pathways prior to transplantation. A small study using this approach in haploidentical HCT recipients was quite encouraging, but has not yet been replicated.101 Thus the focus of most prevention strategies remains pharmacological manipulation of T cells after transplant. The primary pharmacologic strategy to prevent GVHD is the inhibition of the cytoplasmic enzyme, calcineurin, that is critical for in the activation of T cells. The calcineurin inhibitors, cyclosporine and tacrolimus, have similar mechanisms of action, clinical effectiveness and toxicity profiles, including hypomagnesemia, hyperkalemia, hypertension, and nephrotoxicity.9, 107 Serious side effects include transplant-associated thrombotic microangiopathy (TAM) and neurotoxicity that can lead to premature discontinuation. Although clinically similar to thrombotic thrombocytopenic purpura, TAM does not reliably respond to therapeutic plasmapheresis, carries a high mortality rate, and removal of the offending agent does not always result in improvement.108 Posterior reversible encephalopathy syndrome includes mental status changes, seizures, neurological deficits and characteristic magnetic resonance imaging findings; this syndrome has been seen in 1-2% of HCT recipients receiving and calcineurin inhibitors.109 Side effects of these drugs decrease as the dose is tapered, usually two to four months after HCT. Sirolimus is an immunosuppressant that is structurally similar to tacrolimus but does not inhibit calcineurin. In a small Phase II trial, it showed excellent efficacy in combination with tacrolimus;114 the drug damages endothelial cells, however, and it may enhance TAM that is associated with calcineurin inhibitors.115 The combination of tacrolimus and sirolimus is currently being compared in a large randomized multi-center trial. GVHD generally first develops in the second month after HCT, during continued treatment with calcineurin-based prophylaxis.23, 121 Steroids, with their potent antilymphocyte and anti-inflammatory activity, are the gold standard for treatment of GVHD. Many centers treat mild GVHD of the skin (Grade I) with topical steroids alone, but for more severe skin GVHD and any degree of visceral GVHD involvement, high-dose systemic steroids are usually initiated. Steroid therapy results in complete remission in less than half of the patients,122 and more severe GVHD is less likely to respond to treatment.123, 124 In a prospective randomized study, the addition of ATG to steroids as primary therapy did not increase the response rate.124 In a retrospective study, the use of ATG in patients who showed early signs of steroid-resistance was beneficial,122 but not all studies show such benefit and ATG is not standardly used because of increased infection risks.106, 125, 126. An increasingly common treatment for GVHD is extracorporeal photopheresis (ECP). During ECP, the patient’s white blood cells are collected by apheresis, incubated with the DNA-intercalating agent, 8-methoxypsoralen, exposed to ultraviolet light (UVA), and returned to the patient. ECP is known to induce cellular apoptosis, which has strong anti-inflammatory effects in a number of systems, including prevention of rejection of solid organ grafts.127 Animal studies show that ECP reverses acute GVHD by increasing the number of regulatory T cells.128 A Phase II clinical study of steroid-dependent or steroid refractory GVHD showed resolution of GVHD in a large majority of patients, with 50% long-term survival in this very high risk group.129 Randomized multi-center studies of this approach are needed to determine its place in the management of acute GVHD. Meticulous supportive care is critical for patients with both acute and chronic GVHD because of the extended duration of immunosuppressive treatments and because the multiple medications required may have synergistic toxicities. Such care includes extensive infectious prophylaxis, early interventions in cases of suspected infections, and prophylaxis against non-infectious side effects of medications (See Table 3). These complications often require rapid responses to prevent serious or irreversible damage, and are best handled in close collaboration between the primary physician and the transplant specialist. Patients with GVHD often have IgG2 and IgG4 subclass deficiencies despite normal lgG levels, making them susceptible to infections with encapsulated organisms. Treatment of severe hypogammaglobulinemia with intravenous immunoglobulin is standard in many centers,143 but the level that triggers replacement varies considerably among transplant specialists. There is little supporting evidence for the routine use of intravenous immunoglobulin as prophylaxis144 but patients should receive routine prophylaxis (penicillin or its equivalent) due to the increased risk of streptococcal sepsis.145 Pneumococcal conjugate and hemophilus influenza vaccine may provide additional protection and are also recommended for all patients, including those with chronic GVHD.139, 146, 147 The sites of any indwelling catheters should be assessed regularly and early treatment of a suspected infection initiated. Early signs or symptoms of septic shock such as shaking chills or low blood pressure requires prompt evaluation with chest X-ray and/or CT scan, blood culture and broad spectrum antibiotics because shock may progress rapidly in these patients. Aspergillus infections in allogeneic stem cell transplant recipients: have we made any progress? Invasive aspergillosis (IA) is common in allogeneic SCT recipients, with an incidence of 4-10%. The majority of these infections are diagnosed several months after SCT and they are frequently associated with GVHD. The diagnosis is difficult and often delayed. Established IA is notoriously difficult to treat with a death rate of 80-90%. This review summarises recent data on this problem to assess whether there has been any progress. Effective prophylactic measures are still lacking. Severe immunosuppression is the main obstacle to the success of therapy. Recent and ongoing developments in diagnostic measures and new antifungal agents may improve treatment results to some extent, but Aspergillus infections still remain a formidable problem in allogeneic transplantation. Further studies in this field will focus on the role of various cytokines and combinations of antifungal agents.